2014 was a very interesting comics reading year for me. While I would not say I took a step away from superheroes as Kyle did, I definitely found myself reading a lot more independent work as well as giving new (to me) publishers a chance. It was also a year where I found myself following creators over titles, which allowed for the aforementioned exploration of new areas. In the long run, 2014 could go down as a year where my comic tastes began to drastically changed. Below you will find my picks for the 10 Best Comics of 2014. I've never been a big reader of anything from Dark Horse, but 2014 changed that. This year saw the publishing house announce the expected end of their line of Star Wars comics, but that did not stop them from acquiring another big sci-fi IP...or four. It is difficult to say which series out of the four involved in Fire and Stone is the best (though Prometheus gets close). Each of these stories does an excellent job of being both self-contained, but also so intertwined that I found myself just picking all four under their shared label for my pick for this list. A broad, sweeping story that ties together all of these IPs in a way which not only makes sense, but pays great homage to their respective franchises. Great horror and sci-fi action abound. Taking the writers room of a television series approach, with Kelly Sue DeConnick as showrunner, Fire and Stone brought an interesting new(ish) paradigm to comics. It will be interesting to see how Dark Horse capitalizes on this approach as well as how it will use such a talented group of writers and artists in 2015. 2014 was a great year for horror in comics. 2014 was also a great year for Joshua Williamson, who not only took away my #1 comic of 2013 with Ghosted, but now has two spots on my top 10 list for 2014. Oh yeah...and Williamson also won our Rexie for Rising Talent for this year. So what makes Nailbiter so great? It's simply the kind of horror comic we really needed lately. Sure, comics housed in the slasher genre are a dime a dozen, but, like Ghosted and haunted houses before it, Nailbiter takes the concept and turns it on its head. Nailbiter forces you to ask the story and yourself what it takes for someone to become a serial killer. What is it that makes someone want to murder multiple people, usually in horrific fashion? Is it possible it is all just based on where your from? Williamson's Buckaroo, Oregon feels exactly like what you'd expect a small town with a bloody past to feel like, but, like most small towns, Buckaroo has a lot of secrets. In many ways, Nailbiter is like a train wreck. No, it's not a horrible comic, but you do see a lot of horrible things that you just can't help but watch. Williamson does an excellent job of dialing up the horror while providing a more than intriguing mystery and none of this would be nearly as effective without the brilliant artwork of Mike Henderson. I'm a pretty big fan of James Bond and spy stories in general, but they have never been something I've ever felt drawn to in comics. Enter Velvet, the latest creator-owned series from Ed Brubaker and Steve Epting...you know...the guys who gave us Captain America: The Winter Soldier. The concept for Velvet is simple: imagine if Moneypenny were also a spy, perhaps a better spy than even James Bond. Investigating the death of a co-worker, Velvet Templeton finds herself in a globe-trotting spy epic that sees her going up against the very people she has been working for for years. Velvet made its way onto the comics scene at the very end of 2013, making 2014 be the time where we really got to see just what Brubaker and Epting had in mind for this comic. Bond is obviously a heavy inspiration, with Brubaker's writing style often coming off quite similar to that of Ian Fleming. But for all its similarities to Bond, it is in the ways it makes itself different that Velvet really shines. Something as simple as a female protagonist gives a completely different view of the tropes of the genre. Not to mention, the fact that Velvet is perhaps the oldest female lead character in a comic currently being published sets up a new standard for inclusion in comics. The only thing disappointing about Velvet is that 2014 only saw it released every other month. One of the returning comics from my 2013 list, and for a good reason. Jason Aaron has done a lot of amazing work with his stint on Thor. Thor God of Thunder saw me reading a Thor comic for the very first time, and not just reading it, but often enjoying it more than many of the other comics I was reading at the time. 2014 brought some unexpected news early on with the announcement that God of Thunder would be coming to a close with issue 25. 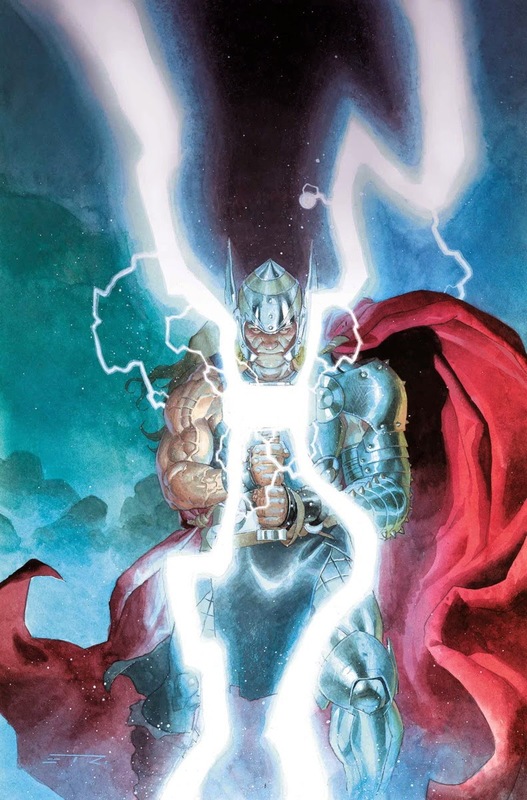 But any sadness that news may have produced was met with a lot of excitement: Jason Aaron would remain on the comic for when it rebooted just a short time later as Thor...with a brand new, female protagonist taking on the role of the thunder god. It would go on to be one of the more controversial comic announcements of 2014, one of the few which made its way from the more comics-centric parts of the Internet to gaining coverage on news outlets such as The View and Good Morning America. So why put both titles in this spot? Simply put, Aaron has done a fantastic job of making Thor the second volume of what will surely be a defining run on the character. The transition from God of Thunder to the relaunched title was so smooth, you almost would have never known the book had started over. A fantastic read for now two years with the incredibly talented Russel Dauterman taking over for the great Esad Ribic, expect Thor to continue to be a must read in 2015. Another comic we love to talk about here on GeekRex. You should have seen this one coming for sure as it was featured on Kyle's list as well. While Thor was wowing us over at Marvel with its fun take on Norse mythology, DC was doing the same thing with Wonder Woman and Greek mythology, thanks to the wonderful work of Brian Azzarello and Cliff Chiang. Their run on the Amazon princess ran from the beginning of the New 52 in 2011 all the way through October of 2014, pretty impressive considering the number of cancellations and switch-ups in creative teams over that same period of time at DC (Scott Snyder and Greg Capullo on Batman are now the only remaining original creative team). Azzarello not only brought a fresh spin on Greek mythology, but re-imagined Wonder Woman's origins, which was both contemporary and refreshing. 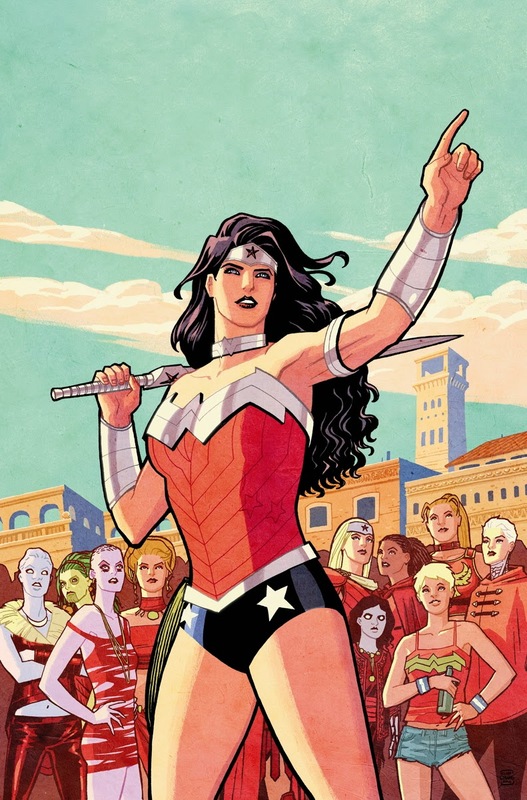 When comics historians, if there is such a thing, look back on when the revolution of strong, female-centric comics began to become a standard in the industry, this run on Wonder Woman with its indie flair better be part of that discussion. As Kyle said before me, this will likely go down as the defining run on that character. Cliff Chiang's gorgeous artwork and Azzarello's standout characters and epic story will make this run a must own for all comic collectors. 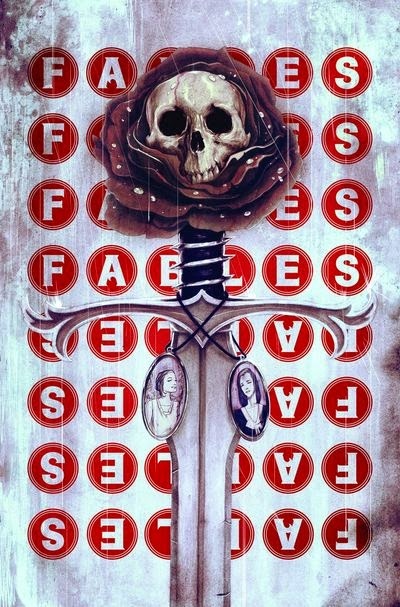 The final full year of Fables. The fairy tale comic only has four issues remaining as we go into 2015, and while I do not think it was the best comic of this year, it was still a solid year of development as this long-running series reaches its conclusion. 2014 saw Fables launch its final, ten issue story arc. Aptly titled Happily Ever After, each issue has been paired with a back-up story detailing the future lives of different characters who survive the upcoming finale. 2014 also saw Fables bring back to life my favorite character in the series, albeit in a fractured state. While the details of just how issue 150 will pan out, the ultimate conclusion seems all but obvious: the various fairy tale characters who have been living in our world for centuries are finally going home. Does this mean the end of their adventures? Not necessarily, but it definitely feels like the most obvious ending for a series such as this, Vertigo's second longest running. This year has seen a few characters return, but it has mostly seen the deaths of quite a few (many of them shocking), showing that writer Bill Willingham will not be going easy on his characters or the fans before his time with them is done. A solid year for my favorite comic of all time, making the coming months all the more bitter sweet. If you've listened to any of our podcasts, you've probably picked up on the fact that I have the most Southern pride of any of our GeekRex crew. Is it the fact that I'm the only one who enjoys college football? I'd like to think so, but it certainly helps that I'm also a big fan of fiction localized in the South. 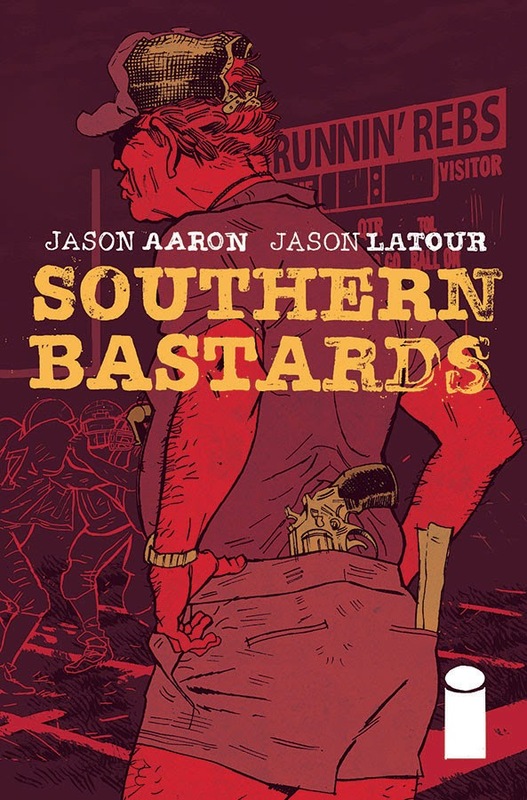 Jason Aaron, a writer I already had a lot of respect for, helped to satisfy those urges for an Alabama-set comic with his latest creator owned series: Southern Bastards. Falling under a genre which could best be called Southern noir, Bastards tells the story of a small Alabama town that is lead by a small group of enforcers who all look up to, unsurprisingly, the local high school football coach. Maybe it's the fact that football plays such a huge part in this series, or that the letters column one month had a recipe for apple pie, or the fact that Jason Aaron and artist Jason Latour are both from the South, but Southern Bastards perfectly encapsulates what it is like to live in this part of the country. It also doesn't hurt that it's a damn good comic as well. 2014 saw Southern Bastards begin and complete its first story arc, which had a shocking ending that showed readers that no one is safe. The second arc has taken this comic to a whole new level, undoubtedly due to Latour's fantastic pencils, which show how beautiful all the ugliness of this story can be. The perfect comic to read while sipping a sweet tea. Roll Tide, Southern Bastards. Another Image book with an irregular release schedule....as well as another repeat from last year's list (albeit it got Honorable Mention last year). Maybe it's because we didn't see a ton of the much-hyped Saga in 2014 that it was able to sneak its way into my top five, or maybe it's because a recent time jump in the story helped to make this year's crop of issues all the more exciting. Either way, if you have ever heard anyone try to tell you that you should be reading Saga....they're right. While Image is certainly leading a revolution in creator-owned indie comics this days, Saga remains one of the most discussed as well as one of the only titles which comics fans who only like superhero comics indulge in on the side. Brian K. Vaughan does such a great job of pulling at our heartstrings with this comic that it's easy for forget that the story is science fiction...until a man with a television for a head kidnaps a tv-head baby and kills a lot of people in his way. The fact that Saga's story still feels like it has limitless potential 24 issues in is one of the reasons it is such a fun comic to read each month. But all praise for Vaughan's story aside, this book would be absolutely nothing without the utterly fantastic work of artist Fiona Staples. Staples is easily one of if not THE best artist working in comics today and you need look no farther than a cover for Saga to see why. But do look inside the cover, though....this comic is great. She-Hulk came to me at a very bad time in my life this year. Literally the same day I lost my job, I went to the comic shop to try and make myself forget about what had just happened. It just so happened that that particular Wednesday was the release of the first issue of Charles Soule's re-imagining of She-Hulk. The comic takes a lot of pages from Matt Fraction's playbook, placing itself in the indie style of Hawkeye in that it details the seemingly more mundane aspects of the main character's life in addition to all the superheroics. Jennifer Walters is a lawyer by trade and this just may be the first time in comics history she was written by someone who is currently a practicing lawyer. 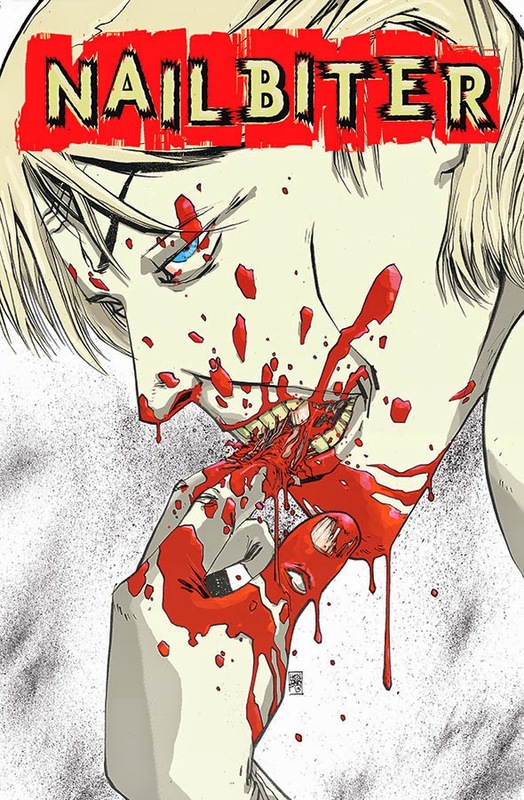 Soule may be one of the hardest working writers in comics and his output remains very strong no matter how many titles he finds himself attached to. Javier Pulido, much like Fiona Staples, is the backbone of his comic. 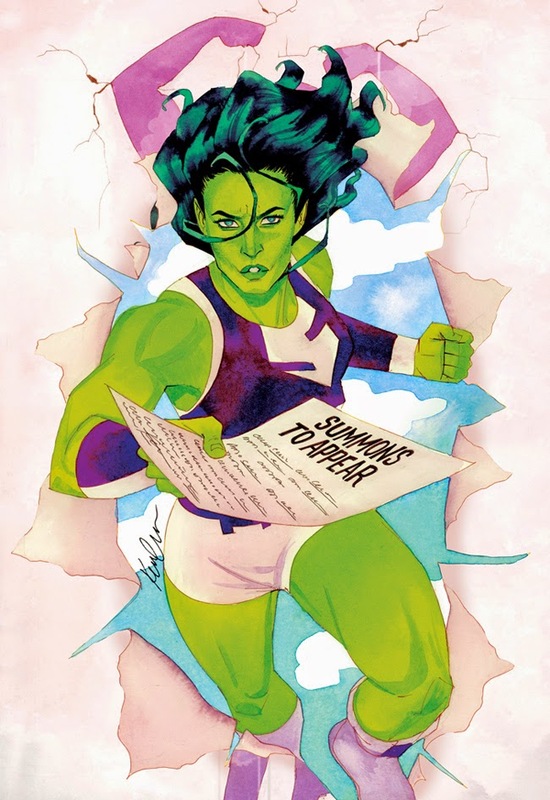 The two issues Pulido did not draw on this run of She-Hulk were quite poor in comparison to the impressive work he was putting out the remaining nine issues. A fun comic that, from the very beginning, hooked me in with its quirky characters and story will sadly be coming to an end this month, meaning this is pretty much the only time I'll get to put this comic on my top list. If it weren't for how spectacular my number one pick is....this would easily have been my best comic of 2014. Thank you Charles, Javier, and Jennifer for helping me through a rough patch in life. Four years ago, I knew next to nothing about DC Comics that didn't relate to Batman, much less anything relating to any sort of DC Multiverse. The New 52 really opened me up to the DC Universe as it did for many other comic readers, so, by the time The Multiversity came out, I found myself prepared to see the alternate versions of this world I felt so much more familiar with. If you ask die-hard comic fans to talk about the greatest writers of the medium, you would be hard pressed for find someone who does not at least mention Grant Morrison. Morrison has definitely taken a lot of inspiration from Alan Moore, serving as his contemporary in many ways, but the Scottish writer has really come into his own over the past few decades, carving a path of great comics which can stand toe-to-toe with anything Alan Moore has ever written. 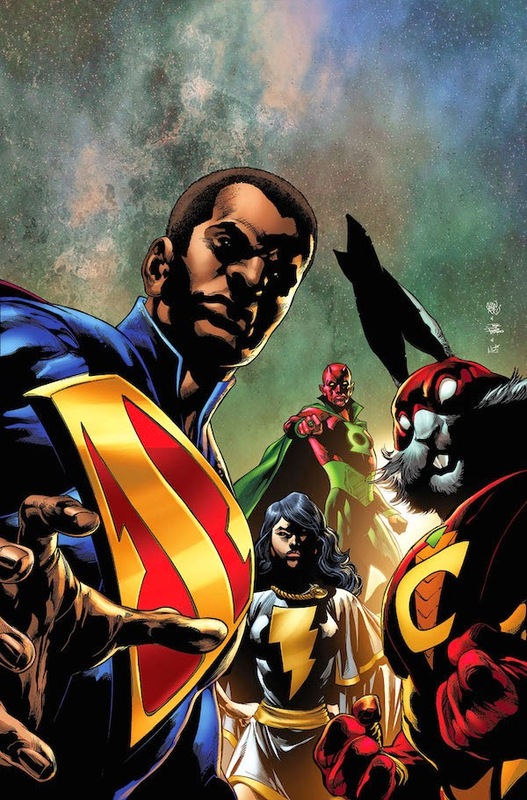 When it reaches its conclusion in April of 2015, The Multiversity will most likely be a part of that list. All coming from the mind of Morrison with the help of some DC's greatest artists, the series follows an invasion of the DC Multiverse, with comics books being the only way the different worlds can communicate. Featuring worlds of pulp heroes, self-centered brats, Shazams, and even a world inspired by Watchmen, you would be hard pressed to find a better superhero comic or story in general from this year than The Multiversity. Check out my list from 2013.